This is a 5 part audio series delivered by A.B. 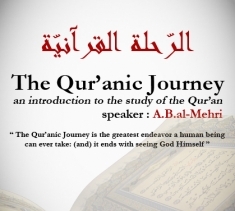 al-Mehri during the course "The Qur'anic Journey: An Introduction to the Study of the Qur'an"
- Qur’an: Structure - What is an Ayat? - What is a Surah? - What is way out of the Fitnah?